Are you still trying to figure out your Halloween Costume? Picking the perfect costume can be a real conundrum. 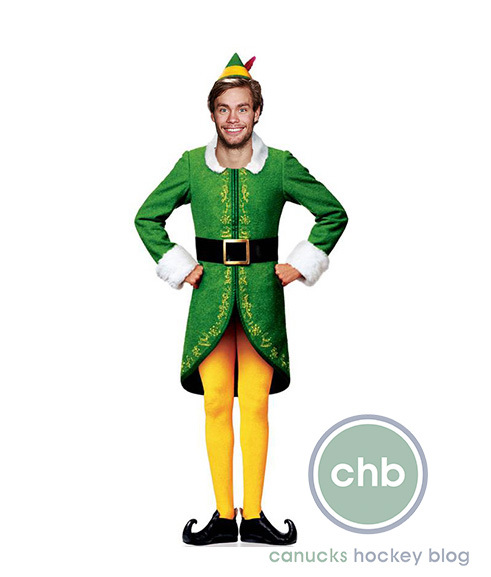 Just in case some of our beloved Canucks players are still searching for the perfect costume, we here at CHB have put together some choice suggestions that are bound to score them lots of candy… and maybe a few laughs. Ricky Boothy… I mean Bobby. This is the perfect costume for Booth because it’s hillbilly-ish which suits him and I’m sure he uses delicious Wonder Bread to make his freshly killed Moose meat sandwiches… or deer meat or antelope or wookie or whatever else he’s killed lately. Only drawback is he has to carry the helmet around because you know he can’t cover that lucious flow. But turn that helmet upside down and it’s a candy bucket! This works for Tom because Frankenstein is all stitched together and Sestito has a lot of facial scars from where he’s been stitched together. Plus at 6’5 and 228 pounds he’s a monster even without the green face paint. Hank and Dank probably have matching outfits lying around somewhere. All they have to do is slap them on and then one of them has to walk on his knees all night and BOOM! Danny Devito and Arnold Schwarzenegger from the ’80s chucklefest “Twins”. Get it? Get it? Hysterical! Okay, well maybe not our best work…. moving on. I read the article about Eddie and Zach Kassian carving pumpkins at Canucks Place and they said it was the first time Eddie ever carved a pumpkin. That made me wonder – do they not celebrate Halloween in Sweden? Has poor Lack never experience the sugar rush of a pillowcase full of chocolate?! If that’s the case then the whole holiday might confuse him. Perhaps it’s best if he clings to a holiday he knows, like Christmas. Plus, I bet he’d look adorable in tights. I’ll be honest, I have no idea who Razor Ramon is. I just want to see Lu with even more grease in his hair and shirtless in a vest. Who doesn’t want that?! 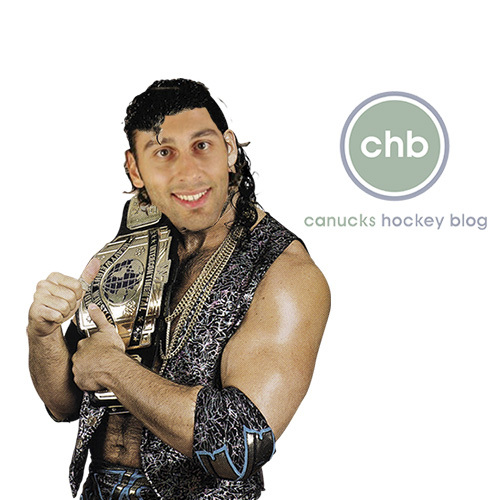 Kesler would make a perfect Wolverine this Halloween. He’s got the hair. He can grown the side burns. And he’s recently rediscovered his beastmode again. Plus I can’t think of one female that wouldn’t give him all their candy if he showed up in nothing but a pair of adamantium claws. Rawr! 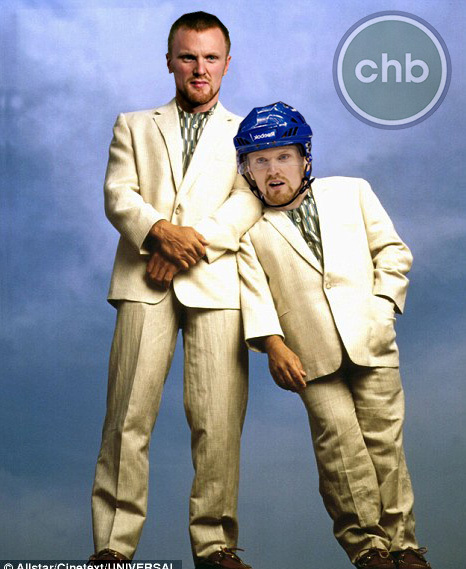 Zack Kassian as Jack Nicholson in The Shining. 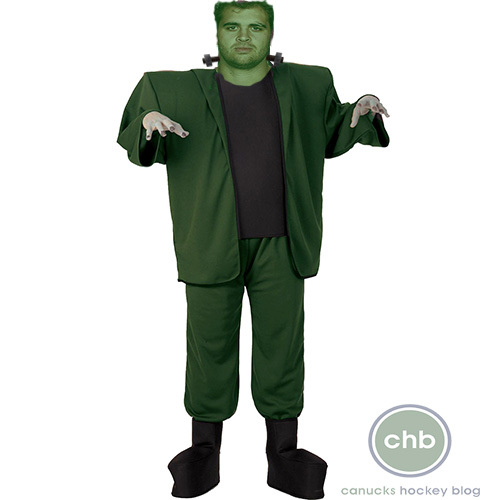 Do you have any costume ideas for Canucks players? What are you going as this Halloween? Tell CHB! 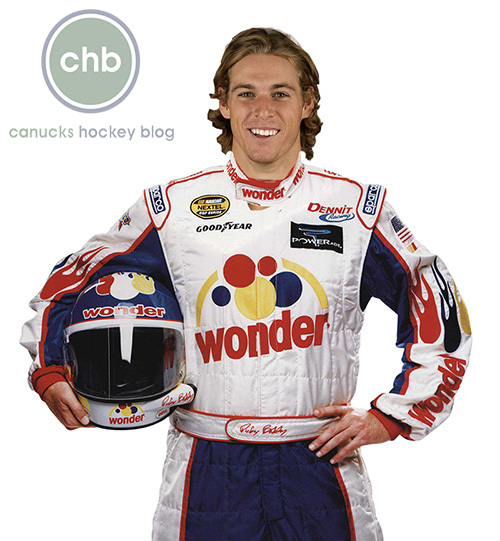 David Booth wouldn’t need the bread for sandwiches since he kills the wildlife for apparently “trophies” only. Since he is a “christian” he should be Saint Francis of Assisi who was the patron saint of animals. Maybe then he will see the light and shoot with a camera NOT inhumane lethal weapons. He can break bread with his new animal friends. Mr. Booth has stated in the media that he kills the innocent wildlife for the “trophy” parts only. Wow cant believe the comments on hunting, weather for trophy or food. How many of you sit down and eat a beef steak or a pork chop, those animals are raised just for slaughter. No time to enjoy their lives, kept in disgusting pens and slaughtered with no chance of enjoying the great out doors nor a chance to reproduce. They are led by the thousands to untimely deaths by a huge steel pole plunged through their skull to render them motionless. Then having their throat slit and left to bleed out. That is okay but for a hunter to hike, track and maybe having the chance to shoot his prey like we have done for thousands of years is heartless or wrong, get a grip and look yourself in the mirror. I for one hunt to put food on the table and as for trophy hunting that meat is seldom wasted as it goes to people that need it or want it through the people that guide these trips. If anyone hunts and wastes the food they should have their hunting rights removed and guns taken away. HAVE A GREAT DAY AND HAPPY HUNTING. Look at the facts > huntining doesn’t mean humane death. The bear baited by Booth was eventually found the following day after an agonizing, painful death. Lots of gruesome killings as bow hunters follow the blood trails to find the victims. People are also fighting the abuses of factory farming too. HAPPY HUNTING WITH A CAMERA!